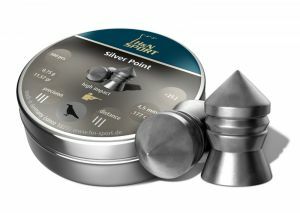 Home › AIR GUNS AMMUNITION › PELLETS H & N › Air gun pellets H & N Silver Point 6.35 mm. Air gun pellets H & N Silver Point 6.35 mm. Pellets for air gun H & N Silver Point 6.35 mm. Caliber 6,35 mm. Weight 1.58 g. Quantity 150 pieces in box. Heavy, accurate hunting pellet for medium ranges. High impact and penetration with maximum shock effect. Smooth with blood grooves.